Tag Archives for " Mark Hansen "
It’s guest post day here at Duct Tape Marketing and today’s guest post is from Mark Hansen – Enjoy! As the use of mobile devices continues to increase, understanding the needs and behaviors of our mobile visitors is increasingly important. Instinctively, we know that mobile users are on the go, so they’re more likely to lose patience with a slow mobile site or poor user experience (UX). But what we need to learn is how they’re finding our site, what their goals are, and what content engages them. Take a read below to learn how Google Analytics can best help you do just that. The first report to review is the Mobile Overview report (Audience > Mobile > Overview), as this will provide an idea of the kind of impact mobile visitors are currently having on your website. Within this report, click the box next to “mobile” in the device row of the table, and then click “Plot Rows.” You’ll now have a chart that shows sessions from mobile users vs. all sessions. This graph shows how your percentage of mobile traffic has changed over time. Within the table of this report, you can also compare the Bounce Rate, Pages/Sessions and Average Session Duration across desktop, mobile and tablet users. You’ll immediately be able to tell whether your mobile visitors are engaged, by comparing them to your desktop visitors. If you have embedded videos or blog posts that aren’t formatted for mobile use, then a high Bounce Rate percentage may be an indication you should investigate further and consider redesigning those pages to improve UX. 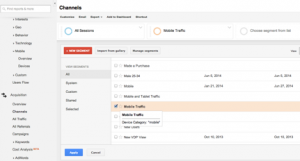 Another useful report is Channels (Acquisition > Channels) with the “Mobile Traffic” segment applied. This tells you where your mobile users are coming from, which can influence how you design campaigns to attract more visitors. For example, if you learn that a large percentage of your mobile traffic comes from Twitter, strategically promote landing pages designed for mobile in your Twitter ads. In the table below the chart, you will see a list showing whether Social, Email or another channel is the primary source for your traffic. You can delve deeper by clicking these terms, like “Social,” to learn what specific websites and networks are driving the most traffic to your site. For example, you may learn 70% of mobile traffic is from Twitter but that the conversion rate is 0% from this platform. Perhaps then, you need to evaluate your site’s mobile conversion experience. You may also test tweeting links to different pages across your site to see which content performs best for mobile users. Google’s Universal Analytics introduced a new tool called User ID that can be essential in understanding your mobile users and tracking conversions. The User ID lets you track a user across multiple devices and browsing sessions. It will give you a better idea of a user’s behavior leading up to their conversion point, helping you adjust your funnel to create more conversions. This functionality requires custom development to set up, which you can read more about here. For example, you can learn that John Doe first visited your site from a Facebook promotion while on his phone. He scrolls through a couple of pages and provides his email for your newsletter but drops off. Then, a couple of days later you can see that John has revisited your website on his desktop computer by clicking a link within an email you’ve sent him. Universal Analytics will associate the same User ID to both visits. Finally, John goes to your site from his iPad and watches a video on how to start a free trial of your service and signs up. Knowing that these three visits were all from the same person can help you better understand your leads and make website improvements. You may notice other users like John, who sign up for your newsletter but don’t begin experimenting with your service until they’ve received more information in the form of an email. Perhaps the incentive you included in the newsletter will serve you better on the website, when visitors first begin learning about your business – ultimately shortening the conversion cycle. It’s imperative to understand how mobile users find your site, how their conversion path differ from desktop users, and how to adjust the mobile experience on your website to encourage these visitors to become customers. When doing this analysis, you may want to put together a full report on mobile traffic, and review it regularly with your team. 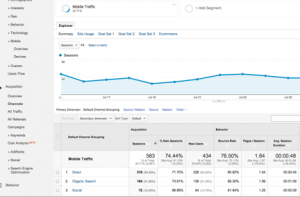 But as a first step, get familiar with the mobile analytics data in the reports discussed here. Mark Hansen is the Founder and President of Megalytic, the leading tool for building web analytics marketing reports. Megalytic is used by digital agencies, marketers and business owners for faster, more insightful and better looking analytics reports. Mark writes a regular blog about Google Analytics best practices for marketers and small business owners.